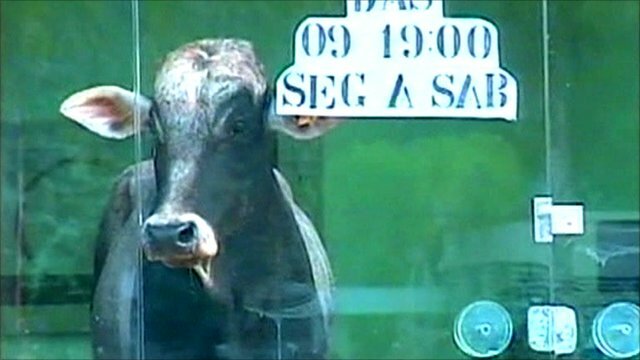 Bull smashes through Brazil shop Jump to media player A bull trapped in a boutique in Brazil has smashed through plate-glass windows to escape. Young German jockey rides a cow Jump to media player A teenage girl in Germany has taken to riding an unusual mount after her parents refused to buy her a horse. A bull trapped in a clothes boutique in Brazil has smashed through the shop's plate-glass windows. Shoppers in the town of Sao Jose do Rio Preto in Brazil were amazed to see the animal - on the loose after the truck it was travelling in overturned nearby - gazing out from behind the glass. After attempts were made to remove the bull with ropes, the animal crashed through the glass shop front. It was eventually caught and taken to a local cattle farm.